Great look back at the style of Apple packaging in the early ’90s by Christopher Phin over at Macworld. For a child of the ’80s like me, that style of photography—moody, low-lit, with shafts of light picking out form and texture—is still desperately exciting. And even as a kid, I was excited about the idea of working, of business, of being productive, so the kind of language and lifestyle you see in the pictures was terribly beguiling. Indeed. Like a haircut, you can tell what era you’re in from the packaging. But Christopher makes an interesting note: all the work done to market the MessagePad on the packaging may have been for naught if they were hidden behind a sales counter. Posted by davelawrence8 at 2:40 pm on November 25th, 2014. No comments... » Categories: newton history. 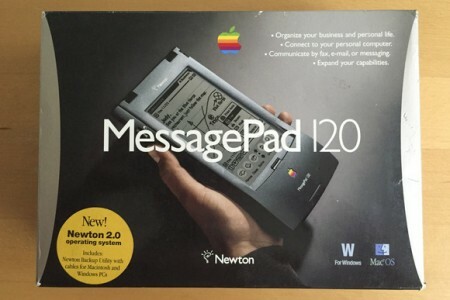 Tags: apple newton, macworld, newton messagepad, packaging. Subscribe via RSS. 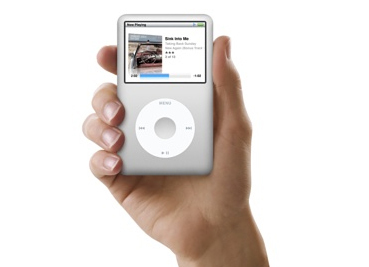 Both iPod classics (black and silver) are ahead of the iPod nano and shuffle in any of their colors. So while many people think the classic is a niche device, this might not be the case. Even if it were a niche, it would be one worth holding onto, because the buyers of this model are the real music fans, with lots of tunes, and want a device that holds as much as possible. Agreed. My first iPod, a 30 GB iPod video from 2005, is still my only classic iPod, and it’s no longer big enough for my music library. I’ve thought about shopping for a refurbished model just so I don’t have to worry about the song juggling that McElhearn talks about. For true music lovers, and especially for those of us with large music libraries, the iPod classic is still a viable option – sort of like a Mac Pro for tunes. Posted by davelawrence8 at 9:57 am on August 24th, 2011. No comments... » Categories: ipod/iphone, music. Tags: classic, ipod, itunes, macworld, music. Subscribe via RSS. Macworld has a four-part “How green is Apple?” series going, exploring the company’s e-waste practices and altruistic motivations. As someone who deals with e-waste on a regular basis, I’ve had my own ethical struggle with Apple’s environmental practices. But it’s this kind of pressure, and pressure from their customers, that will ultimately make Apple more open about its “green” behavior. Posted by davelawrence8 at 5:08 pm on April 22nd, 2009. No comments... » Categories: apple, environment. 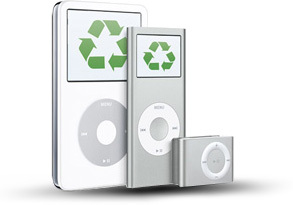 Tags: apple, e-waste, environmental, green, greenpeace, mac, macintosh, macworld, recycle, recycling. Subscribe via RSS. - John Gruber of Daring Fireball, right before Macworld 2003. Posted by davelawrence8 at 6:51 am on March 24th, 2009. No comments... » Categories: blogs, ipod/iphone, newton. Tags: daring fireball, gruber, ipod, macworld, messagepad, newton. Subscribe via RSS. And there’s some truth to that. My iBook G4 is still my main computer, and I’ll probably never (ever) get rid of it. But the best Mac? It has to be the iMac G4. You, dear reader, probably saw that one coming, right? 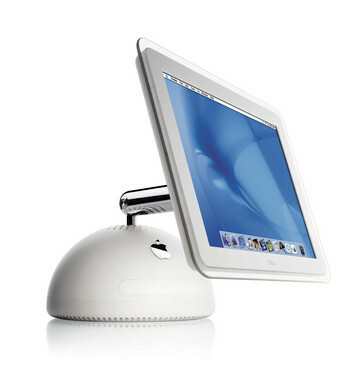 My time with Macs has been relatively short, but I remember the iMac G4 taking my breath away when I first saw it, and it was the first Mac to really get me thinking about switching to Apple. Now I use mine every single day. The entire G4 line has been good to me, and they’re the fastest and newest Macs I’ve owned. What do you think? What’s the best Mac ever? Posted by davelawrence8 at 6:28 am on January 23rd, 2009. 5 comments... » Categories: macs. Tags: apple, best, g4, imac, mac, mac se/30, macworld. Subscribe via RSS. For history buffs, Apple is a natural attraction for how modern technology companies evolve, behave, and operate. Since its founding, Apple has attracted pirate programmers and designers, a dedicated fan following, and tons of media attention. In just 30 years, the company has ridden a roller coaster of success and near-death – multiple times – has today lives on as a super-successful electronics company. This year marks the 25th anniversary of the Mac, and as Wired’s Steven Levy puts it, Apple will look forward instead of back. 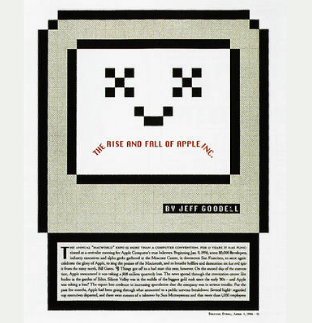 The story of Apple’s decline is a morality tale for the Information Age. It is not, as one might expect, a story about how quickly the technology moves, or about how unforgiving and brutal business has become in Silicon Valley. In fact, Apple had many, many chances to save itself. But it didn’t. It was the company of the future that failed to see what was right in front of its nose. And while Apple will no doubt reinvent itself in the years to come, the central idea that animated the company for so long – that Apple is a revolutionary force, that it could change the world – is dead. Not any more, it’s not. But there is a weird feeling of dread and uncertainty, not unlike what a lot of people are feeling about the economy, or about Steve Jobs’s succession plan, and a lot of it stems from what we don’t know about Apple. What’s the “next big thing?” What effect will the economy have on Mac, iPod, and iPhone sales? “There is no happy ending here,” Goodell writes. At the time, it must have seen certain. But soon after Rolling Stone published that article, Steve Jobs returned, and things turned around. Taking the long view, Apple has been in far worse situations (coincidentally, mostly when Jobs was absent). A whole new body of people who have creative ideas, but aren’t programmers, will be able to express their ideas – or their expertise in a certain subject. Even the Newton was a product ahead of its time, giving business professionals and regular folks the ability to manage their day-to-day data in a simple and intuitive way. As a history buff, I like reading about Apple’s early successes and tribulations. It shows a company constantly growing, constantly in flux, and – for the most part – learning from its mistakes. The common thread that runs through Apple’s story is a company setting out to make machines and applications that make our lives easier. I almost typed “better” there, but I don’t think that’s true: if we didn’t have the iPod, we may not miss it. But simple. Easy. More intuitive. Even fun. That’s what Apple has given us the past 30 years. The success of the Mac is a testament to that ideal. So while Steve Jobs and Apple in general may not celebrate the Macintosh’s birthday this month, us Mac fans can in our own way. We do, everyday, when we wake our iMac up from sleep, or scroll through our music library on our iPhone, and live our lives a little easier. Posted by davelawrence8 at 6:58 am on January 8th, 2009. No comments... » Categories: apple, macs. Tags: apple, apple II, bill atkinson, history, hypercard, ilife, mac, macintosh, macworld, steve jobs, success, visicalc. Subscribe via RSS. Tons of books and all. 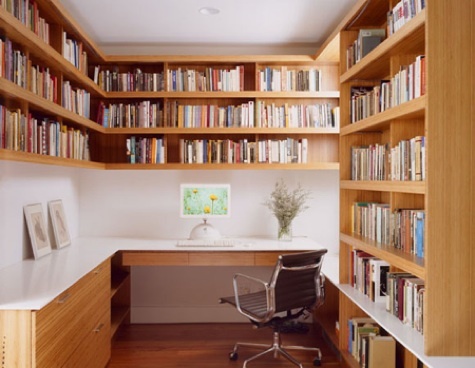 I wish my own office were that clean and tidy. Happy Macworld Keynote Day. I’ll probably be catching the live blog feed somewhere (Gizmodo usually does a nice job) and hoping for some kind of cool announcement. I actually thought about going to Macworld this year, and just as I was about to hit the “purchase tickets” button, the news hit that Steve Jobs wasn’t going to be there. Much like Apple, my decision was financially-based: can I really afford a trip out to California? So I may have missed my chance to see Steve Jobs deliver a “one more thing” announcement forever. But hey, there’s always WWNC. Posted by davelawrence8 at 6:46 am on January 6th, 2009. 2 comments... » Categories: apple, macs. Tags: apple, g4, imac, imac g4, macintosh, macworld, office, organization, organize, remodel, steve jobs. Subscribe via RSS. This Macworld keynote from Steve Jobs, as he announced the original iPhone in January 2007, remains one of the best ever. Now we learn that Apple has breached the 10 million iPhone mark, with 7 million iPhone sold last quarter alone, I think it’s pretty cool to look back and see how all this started. It still gives me chills when he lets his crowd in on the joke. Posted by davelawrence8 at 6:06 am on November 5th, 2008. No comments... » Categories: ipod/iphone. Tags: 2007, apple, intro, introduction, iphone, launch, macworld, steve jobs, youtube. Subscribe via RSS. I’m all about the classic Mac’ing around these parts. That’s why I thought Jason Snell’s “A Time Machine trip to the mid-’90s” article for Macworld.com was so darned cool: he lets us know about some of the never-to-see-the-light-of-day features of Copland, Apple’s vaporOS. I remember reading about Copland and Pink and all the other weird OSes Apple was planning, but it was cool to see the operating system screen shots. Love that ’90s styling – takes me back to the Packard Bell computer my dad bought (and I ruined). Check it out for a neat comparison on features in Copland and today’s OS X Leopard. Posted by davelawrence8 at 7:02 am on October 23rd, 2008. No comments... » Categories: apple, lowend. Tags: apple, backup, copland, mac, macintosh, macworld, OS, os 8, OS X, time machine, vaporware. Subscribe via RSS. Boy, that first guy, Stewart, reall is grumpy, isn’t he? By this time, PDA (or “palmtop” as the reporter says) technology was in the “Model T” stage, as Tim the Analyst says in the video. Neat to see the Windows 3.1 desktop there, as well as real, live people actually working with the Newton. Talk about retro. Posted by davelawrence8 at 8:27 am on May 21st, 2008. No comments... » Categories: messagepad, newton history. Tags: 1994, computer chronicles, macworld, messagepad, newton, video, youtube. Subscribe via RSS.